Bournemouth have signed Burnley midfielder Garreth O'Connor and Leicester winger Max Gradel on loan. O'Connor, 28, returns to his old club for two months but there is the possibility that his spell at Dean Court may be extended. Gradel, 19, will spend an initial month with the Cherries. The Cherries have also signed Portsmouth keeper Asmir Begovic and midfielder Jean-Francoise Christophe on loan until the end of January. 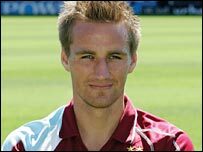 O'Connor made 168 league appearances for Bournemouth in a five-year spell with the Cherries before joining Burnley on a Bosman-style free transfer in the summer of 2005. However, he was transfer-listed in May after falling from favour at Turf Moor.